For the film, see The Figurine. For other uses, see Figurine (disambiguation). A figurine (a diminutive form of the word figure) or statuette is a small statue that represents a human, deity or animal, or in practice a pair or small group of them. Figurines have been made in many media, with clay, metal, wood, glass, and today plastic or resin the most significant. Ceramic figurines not made of porcelain are called terracottas in historical contexts. In China, there are extant Neolithic figurines. European prehistoric figurines of women, some appearing pregnant, are called Venus figurines, because of their presumed connection to fertility. The two oldest known examples are made of stone, were found in Africa and Asia, and are several hundred thousand years old. Many made of fired clay have been found in Europe that date to 25-30,000 BC, and are the oldest ceramics known. Olmec figurines in semi-precious stones and pottery had a wide influence all over Mesoamerica about 1000-500 BC, and were apparently usually kept in houses. Porcelain and other ceramics are common materials for figurines. Ancient Greek terracotta figurines, made in moulds, were a large industry by the Hellenistic period, and ones in bronze also very common. In Roman art bronze came to predominate. Most of these were religious, and deposited in large numbers in temples as votives, or kept in the home and sometimes buried with their owner. But types such as Tanagra figurines included many purely decorative subjects, such as fashionable ladies. 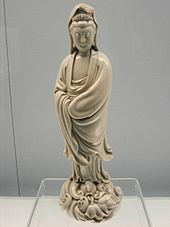 There are many early examples from China, mainly religious figures in Dehua porcelain, which drove the experimentation in Europe to replicate the process. The first European porcelain figurines, were produced in Meissen porcelain, initially in a plain glazed white, but soon brightly painted in overglaze "enamels", and were soon produced by neally all European porcelain factories. The initial function of these seems to have been as permanent versions of sugar sculptures which were used to decorate tables on special occasions by European elites, but they soon found a place on mantelpieces and side tables. There was already some production of earthenware figures in English delftware and stoneware, for example by John Dwight of the Fulham Pottery in London, and after 1720 such figures became more popular. By around 1750 pottery figures were being produced in large numbers all over Europe. Genre figurines of gallant scenes, beggars or figurines of saints are carved from pinewood in Val Gardena, South Tyrol (Italy), since the 17th century. Modern figurines, particularly those made of plastic, are often referred to as figures. They can encompass modern action figures and other model figures as well as Precious Moments and Hummel figurines, Bobbleheads, Sebastian Miniatures and other kinds of memorabilia. Some companies which produce porcelain figurines are Royal Doulton, Lladró and Camal Enterprises. Figurines of comic book or sci-fi/fantasy characters without movable parts have been referred to by the terms inaction figures (originally used to describe Kevin Smith's View Askew figurines) and staction figures (a portmanteau of statue and action figures coined by Four Horsemen artists to describe Masters of the Universe figures). There is also a hobby known as mini war gaming in which players use figurines in table top based games. These figurines are mostly made of plastic and pewter. However, some premium models are made of resin. ^ "New range of 'gypsy wedding' figurines launched by Camal Enterprises". The Sentinel. Retrieved 1 June 2015.